Magnificent yet forgotten, the Moors were the world’s great medieval civilization, inhabiting Spain from the eighth to 15th centuries. 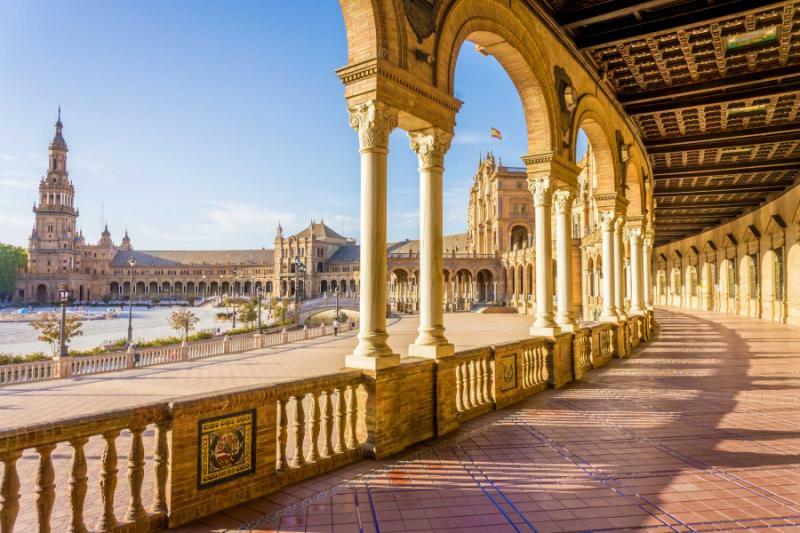 Immersing you in their history and design, this 13-day Spain tour through Andalusia celebrates the story of a civilization that redefined art and culture, the beauty of their monuments still inspiring the design of today. White villages, alcazars, mosques turned cathedrals, Mudejars, and Moriscos; you find charm and soul in the south of Spain. Not much has survived from Europe’s medieval centuries. Battles were waged, innovation stalled, art was at a standstill across most of the continent. After the Greeks and the Romans came a period of seeming nothingness, before the explosion of the Renaissance and the Gothic. This interpretation of medieval Europe is one-sided, overlooking one of the greatest civilizations ever to grace the planet, the Moors. Once powerful, now mostly forgotten from world history, the Moorish realm stretched across the Iberian Peninsula (modern day Spain and Portugal). 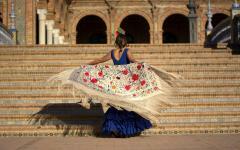 Cordoba is its beating heart, the world’s most cultural city in the 10th and 11th centuries. When their lands were taken over, their legacy continued, the Moriscos and Mudejars dictating artistic ingenuity up to the 16th century. 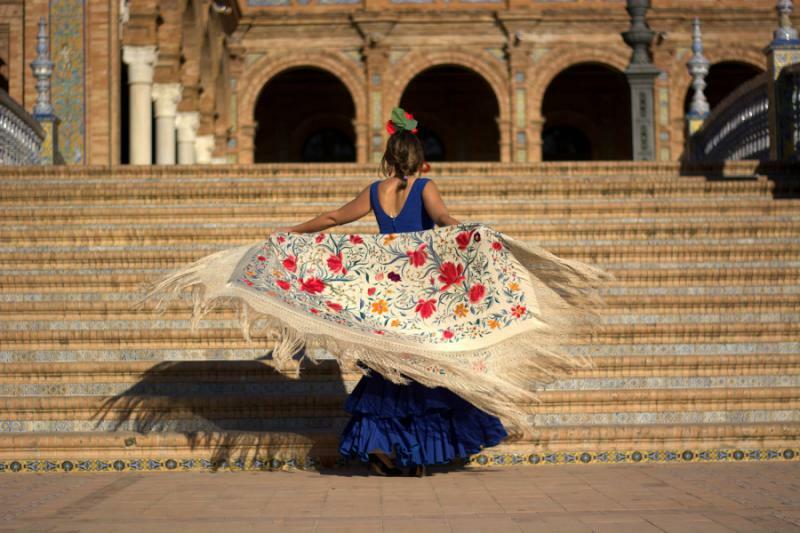 In the 21st century, spectacular examples of Moorish culture continue to cover the southern Spanish state of Andalusia, and the experience is immersive, cities and villages hardly changed since the medieval era. This privately guided 13-day tour celebrates the beauty and bequest of the Moors, exploring the less than subtle contrasts between the centuries, as well as the brilliant diversity of the designs. Starting with the time of the caliphate in Cordoba, the Mezquita is a mesmerizing introduction to the art, and you take a journey across the Moorish memoirs in Andalusia. Spend two days in the Pueblos Blancos (White Villages), Arcos de la Frontera and Ronda an immersion in the whitewashed style of Moors evading looters and pirates. 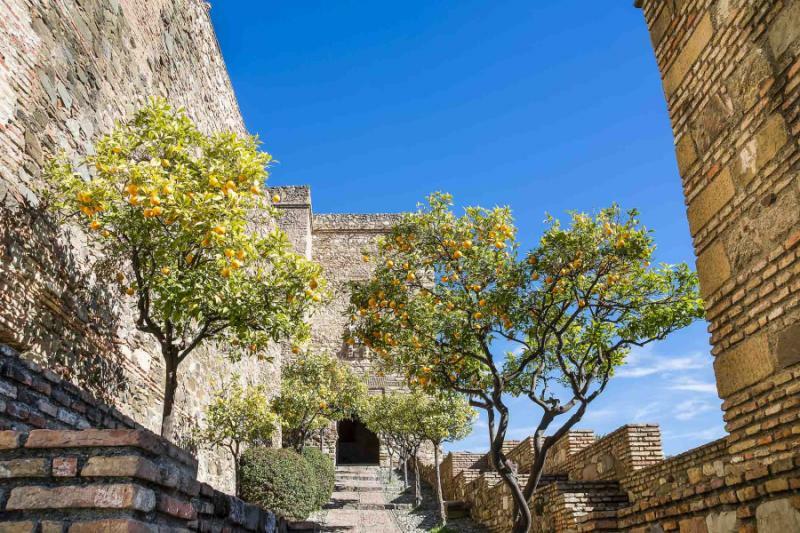 Take in the cathedral castles of Malaga and Almeria and how the grand design is built upon what the Romans left behind. 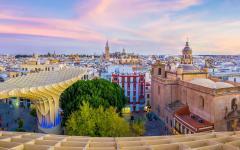 In Seville, you spend two days exploring the legacy of the Mudejars, Islamic people of Moorish descent who stayed in Andalusia following the fall of Cordoba and the caliphate. 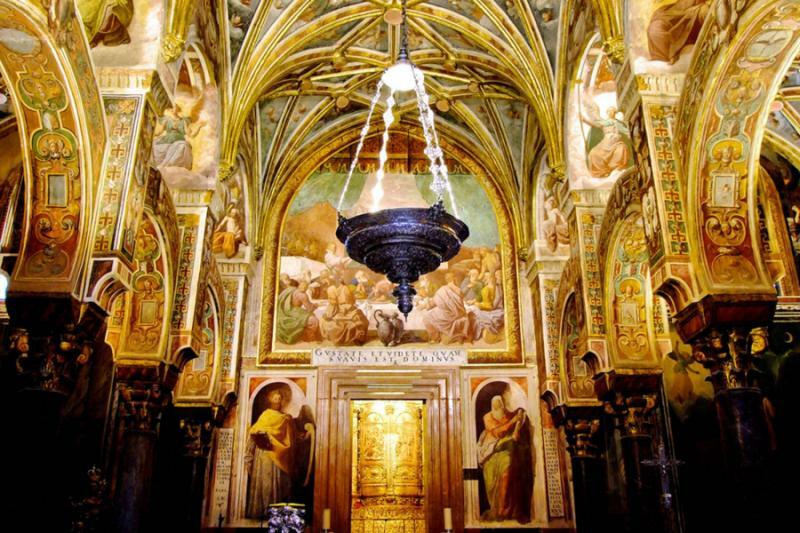 Later, on this exclusive Spanish tour, two days in Ubeda and Baeza present the brilliance of the Moriscos, Moorish descendants who converted to Christianity, fusing influence from Renaissance Italy in their sought-after artisanal designs. 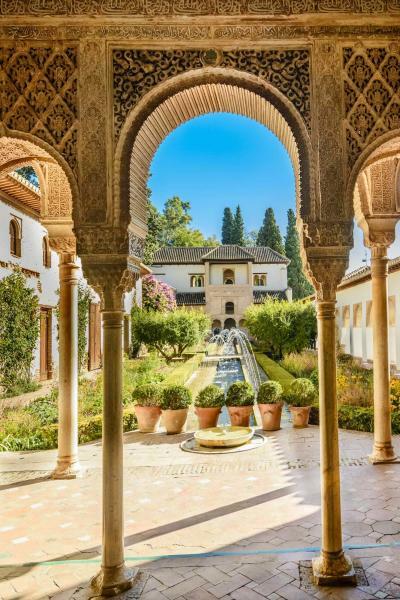 Granada was the final Moorish stronghold, surviving until the year Columbus reached the New World, and two days in this labyrinthine city are an insight into the old world of the Nasrid Kingdom. Guided by a Moorish expert and afforded the time to ensure a leisurely pace, this is an illuminating journey through one of the world’s greatest cultures, and a history that deserves far more international recognition. 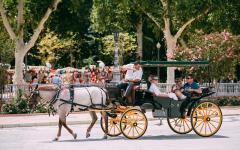 Extend your tour to Spain by seeing the other ways you are able to customize your Spain itinerary. 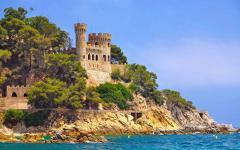 Learn more about how your luxury Spain tour company can personalize the vacation of your dreams. 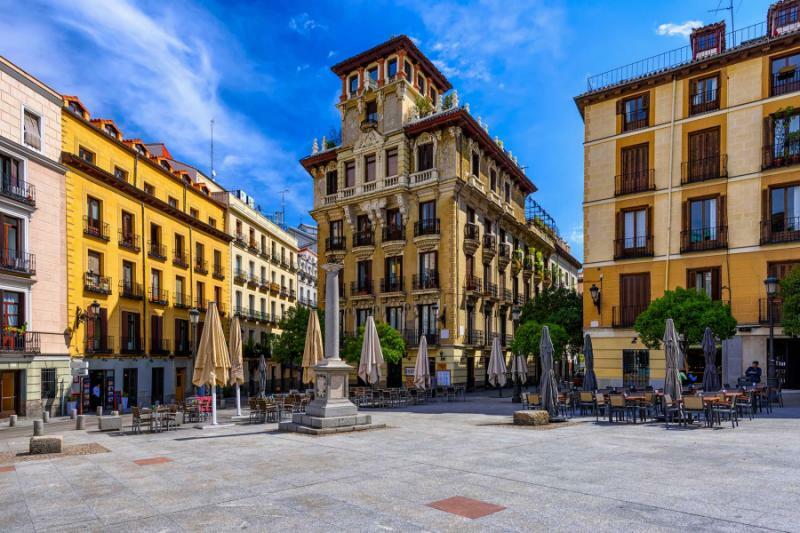 Fly to Spain’s largest international airport, and spend the night in the capital at your hotel that is within walking distance of the grand Plaza Mayor (central square) and an assortment of cobblestone streets. 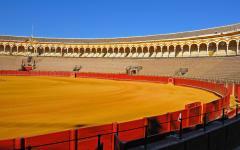 From Madrid, it is a short journey by high-speed train to Cordoba, and the capital makes for the most convenient place to start and is a relaxed introduction to Spain. Explore at leisure, embracing your first flavors of the country, such as chocolate and churros or al fresco tapas terraces. 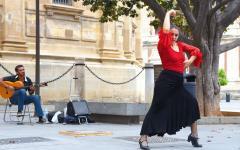 The immersive historical tour starts tomorrow, but today is focused on relaxing and tuning your footsteps into the languid Spanish pace. 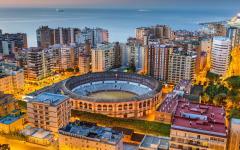 Every world century has a defining city of culture. 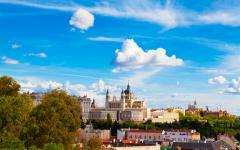 Athens, Rome, Florence, and Cordoba. The Caliphate of Cordoba expanded from the late eighth century. The people, religion, and culture come from across the water and North Africa. 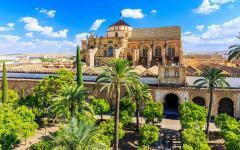 In the ninth and 10th centuries, Cordoba was the soul of world culture, with the elaboration of art and design far exceeding what was being created elsewhere in Europe. 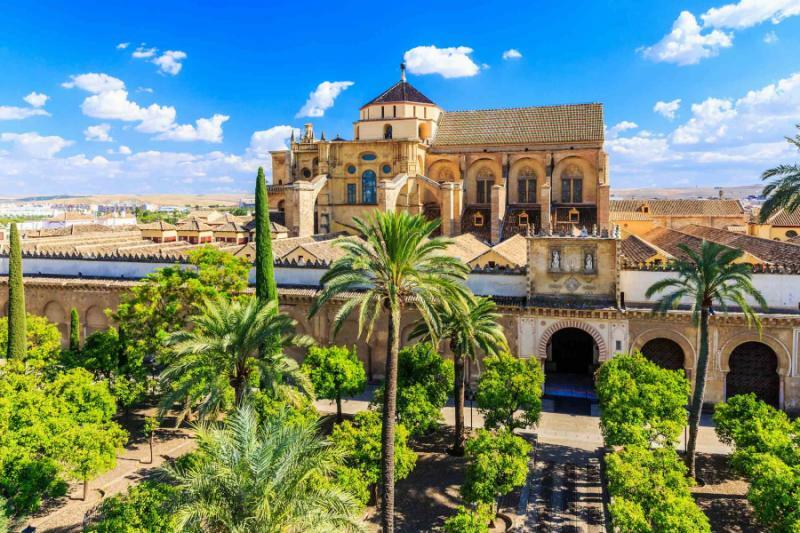 One building symbolizes the time and the Moors, the Mezquita a perfect introduction to this private tour, an eighth-century mosque wrapped around a 16th-century cathedral, framed by mythology and mesmeric design. It has changed over the centuries, and your guide helps provide a historical walkthrough, the evolutions epitomizing how the Moors also changed over time. The remains of a Visigoth church wall indicate what came before, although it can be hard to focus on this detail when you are confronted by 850 granite and marble columns that sustain the roof in the center of the Mezquita. Intricate calligraphy twirls around prayer niches, golden leaves inhabit the corners, the work of both Mudejar and Morisco artistic schools comes alive on a grand scale. Then there is what came next when this Grand Mosque became a working cathedral. 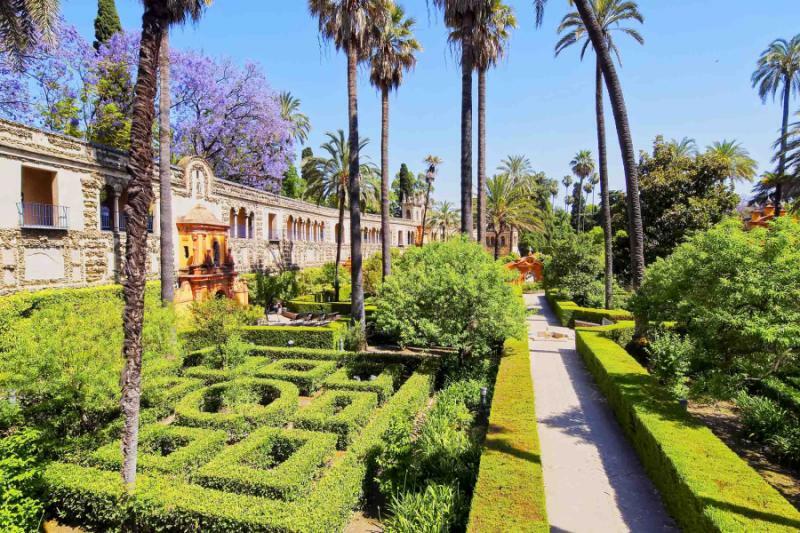 Take the train to Cordoba and meet your guide for lunch, before the afternoon is dedicated to this exceptional and most important of all Moorish sites. The evening is at your leisure, and this once great city retains much evidence from its time as a cultural pioneer. 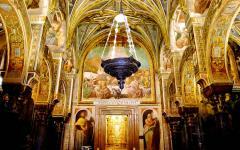 The remains of Cordoba are alive in both its architecture and atmosphere. Artisanal stores continue to dot the maze-like lanes of the center, shouts and smells ring out across traditional marketplaces, and small squares have the quaint feel of centuries past. Most people who stop here come only for the Mezquita, but look further, and you get a real sense of early Moorish culture. This is the city from which the caliph once ruled over the entire Iberian Peninsula. With an expert guide, the streets come alive, particularly the remnants from the eighth to 11th centuries that stretch out beneath the looming walls of the Mezquita. Complete a relaxed day of exploration with a dinner at a restaurant on Plaza de los Capuchinos, where wrought-iron lanterns illuminate the scene. 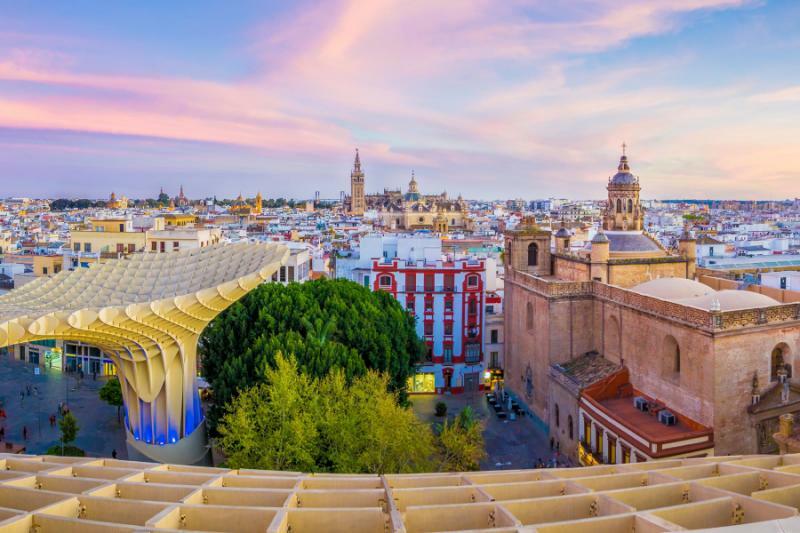 Exuberant Seville is a fusion of styles, a city from Moorish times that flourished when it was granted exclusive port rights for ships going and coming from the New World colonies. The whitewashed harmony of the walls holds the city’s contrasting artisanal styles together and is probably the oldest legacy from the Moors. 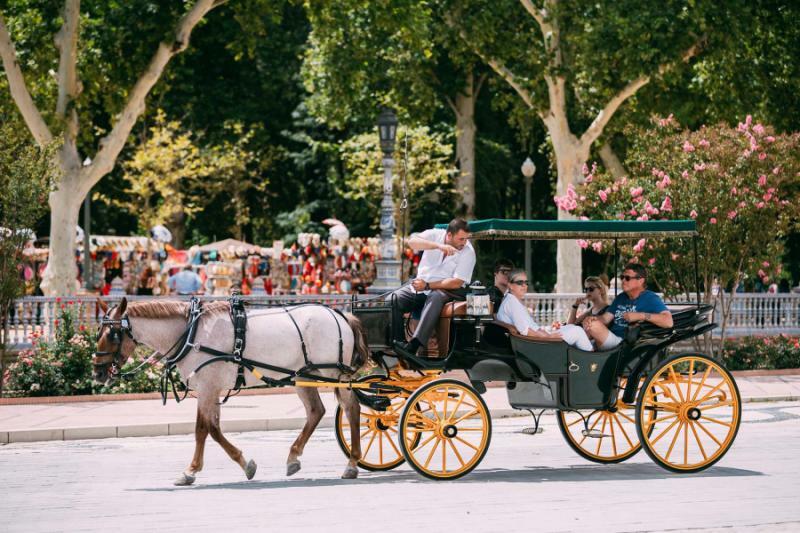 Take the train here and spend the day experiencing the city’s unmissable, including the Gothic cathedral, the Museo de Bellas Artes, and a horse-drawn carriage ride between the plazas. 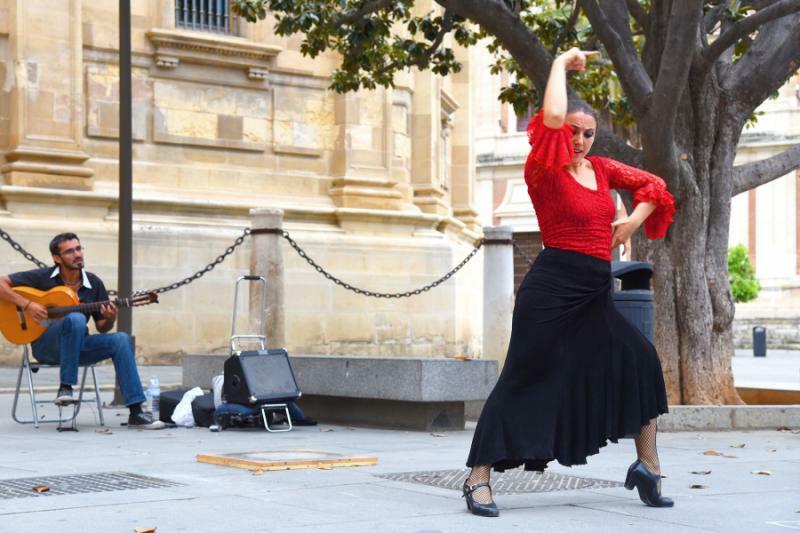 While it is not Moorish, the art form of flamenco comes from Seville and is an option for the evening, along with what is arguably Spain’s best traditional tapas experience, hopping between bars in the area of Al Arenal. Mudejar intricacy embellishes buildings all across Seville, the Royal Palaces a grand place to start exploring the style. When the Christian monarchs of the north gradually took over the Moorish lands, the Moorish people stayed. Unlike the Moriscos, the Mudejars retained their religion, their name coming from the Arabic mudajjan (literally “allowed to stay.”) From the 12th to the late 15th centuries, their artisanal brilliance was much sought after, elevating the drab and bulky Romanesque styles that were favored by the church. From the Royal Palaces, you take a walk through the city, admiring hidden remains of emblematic Mudejar style: seductive calligraphy, archways of color, tiles of blue framing bars selling ice-cold sherry, and alleyways that you can walk a dozen times and always notice something different. From the cities of grandeur to the villages of white, you take a drive across the hills of Andalusia, where the Pueblos Blancos cling adoringly to the tops of cliffs. The Moorish rule was not always a time of peace, with raiders and pirates coming across the Mediterranean on looting missions. When the caliphate ended, a period of unrest meant the raiders also came from inland, so the Moors built their villages in the hardest to reach places, on the highest of peaks, where no intruder could arrive unannounced. Arcos de la Frontera is the classic Moorish White Village, seductively small and peaceful, particularly when day-tripping visitors have left and you enjoy a night in one of Spain’s best paradors, a castle turned hotel that completes your immersion into the village’s history. The road to Ronda passes two small Pueblos Blancos, ascending through olive trees to villages that you can walk around in 20 minutes, but you could spend two hours inspecting all the details. Untouched by time and enhanced by their dramatic location, these villages have an almost fairytale ambiance. Today’s relaxed drive takes you east across Andalusia, through the mountains to Ronda, the oldest and most spectacularly situated of the white villages (and also a city with Greek heritage). 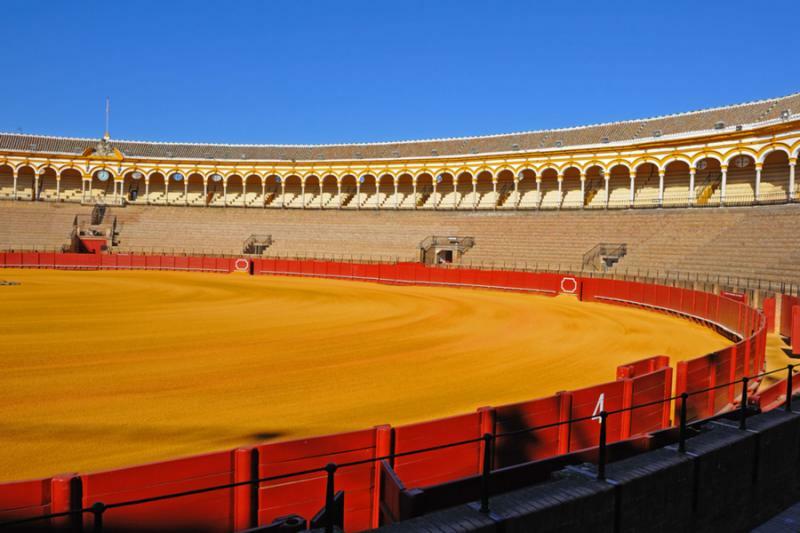 Spend the afternoon exploring with the guide, the iconic Moorish style interspersed with Renaissance design and a look at Spain’s most famous bullring. While the work of the Mudejars and Moriscos tell what evolved after the Moors, Malaga starkly presents what came before. A Roman amphitheater stands above the Mediterranean, thick slabs of stone flowing beneath a rustic Moorish castle. This was the Moors’ port, and the fortress is thicker and more imposing than any other, built to ward off the continual marauders. As the guide takes you through the castle, you discover how it is mostly built upon a Roman castle. What remains here is crumbling, disintegrating in the salty air, wonderfully archaic in its outward appearance. 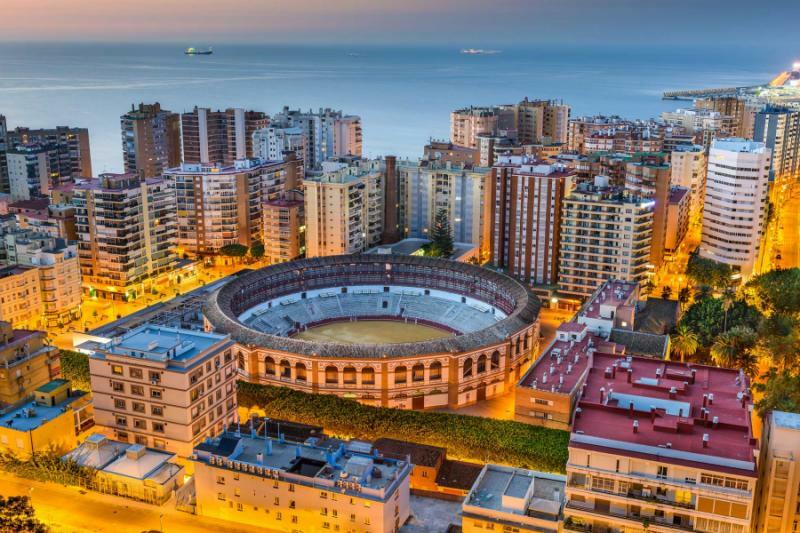 Later in the day, you will also discover Malaga’s other highlights, as this is the city where Picasso spent his formative years and where much of his early work is presented. Even larger than Malaga, the fortress of Almeria continues your immersion in a time of rebellion and raids. In this small town, you will also find a gypsy quarter where locals live in caves and the whitewashed stone of an old city that appears as if it was permanently under siege. It is a stop en route to Granada, the second great city of the Moors. After the caliphate in Cordoba came a time of individual Moorish kingdoms, with only the Nasrid Kingdom continuing beyond the end of the 13th century. Granada was the base of this kingdom, and it held strong until 1492. 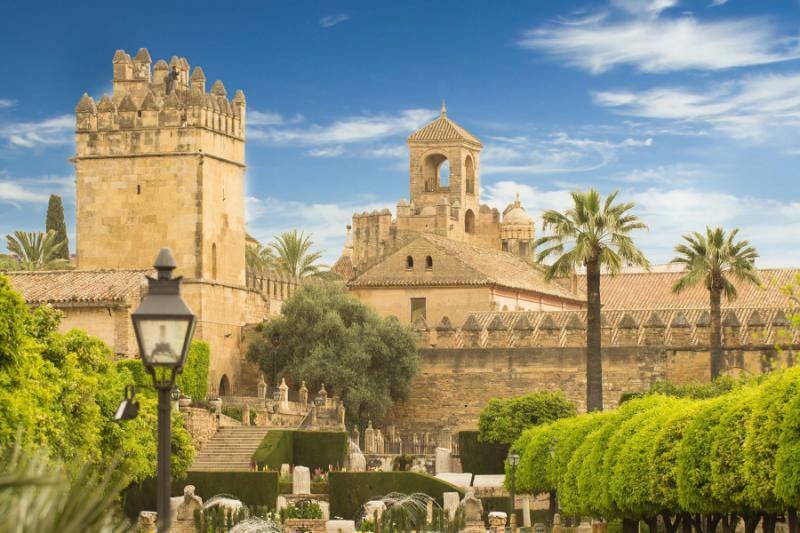 While Cordoba looks like a postcard, this final Moorish bastion is rough and rugged around the edges, creating an allure that symbolizes its peculiar history. Tomorrow, you can see the famous sights, but today, you get to wander the narrow, hilly streets where the stirring of the counterculture and modern Arabic prose mingle with the poetry of the old gardens and palaces. It is a city of fable and fiction, one that implores you to turn another corner and seek out the treasures that hide in the shadows. 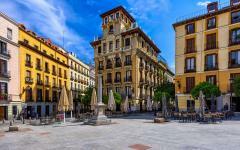 Granada is a city with atmosphere, one that allows proud history to mingle with the vibrancy of today. During the evening, you have the chance to explore some of the many little tapas taverns, nationally regarded as having some of the best food in Spain. The Alhambra looks magnificent in the morning light, the sun reflecting gently off the golden walls. Head inside, following the fluted columns to the magnificent geometric details on the ceilings. From the outside, this is an imposing fortress, the design dominated by the need for defense. 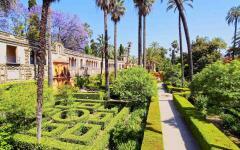 On the inside, it is all charm, such originality in the ascetics and gardens. Continue the inspirational look at history as you explore the white walls that surround exotic gardens of North African flora, then feel the relics of history as you try to make sense of a city that is dominated by riddle. 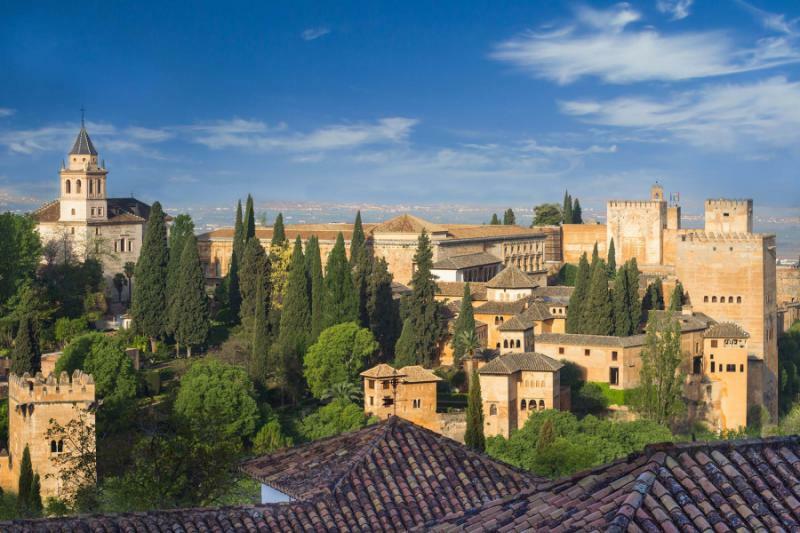 Other than the Alhambra, nothing is clear-cut in Granada, creating a city as enigmatic as any in Europe. For the last ten days, you have mostly explored the artisanal brilliance of the Moors and the Mudejars, a style firmly vested in Islam and tradition. 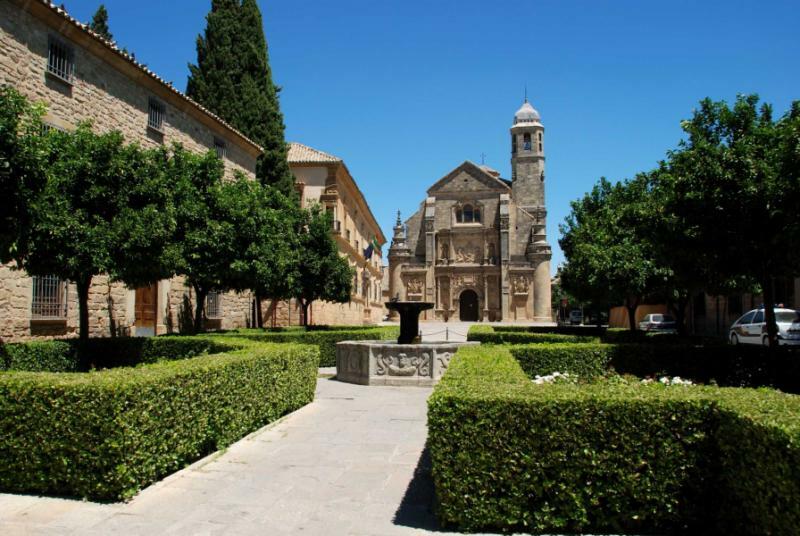 Spending two days in Ubeda and Baeza, you are immersed in the legacy of the Moriscos, Moorish descendants who converted to Christianity around the time of the Reconquest (some of them forcibly). They were inspired by the same artistic and architectural foundations, like a love for symmetry, a passion for details, and ability to use white for elaborate features to fully stand out. 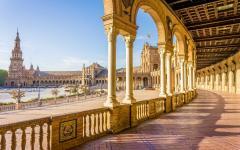 In these two World Heritage cities, the Moriscos added a strong scent of their newly found religion, importing the exciting idea of the Italian Renaissance to Spain. The results are rare and beautiful, with only a small semblance of commonality with the other places you have visited in Andalusia. Palatial mansions are dotted with swirls of color, cherubs look on from the churches, and winding white-washed lanes are sprinkled with the soft hues of the Renaissance. A hospital is flanked by a spire laden with blue and white tiles, plazas seem halfway between the Middle East and Italy, and elaborate figures line the archways of cathedrals. 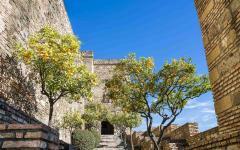 You will spend the evenings in Ubeda, staying at a grand parador in the heart of the city. On day 12, you make a trip to Baeza, a city just nine kilometers away, entered through a gateway that has not been touched since the 16th century. 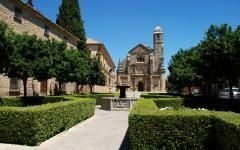 To leave Andalusia, you transfer back to Granada by road, site of the closest airport to Ubeda. Crossing the plains of Andalusia, you wave farewell to the land of the Moors, a tiny village glistening on a distant hill. 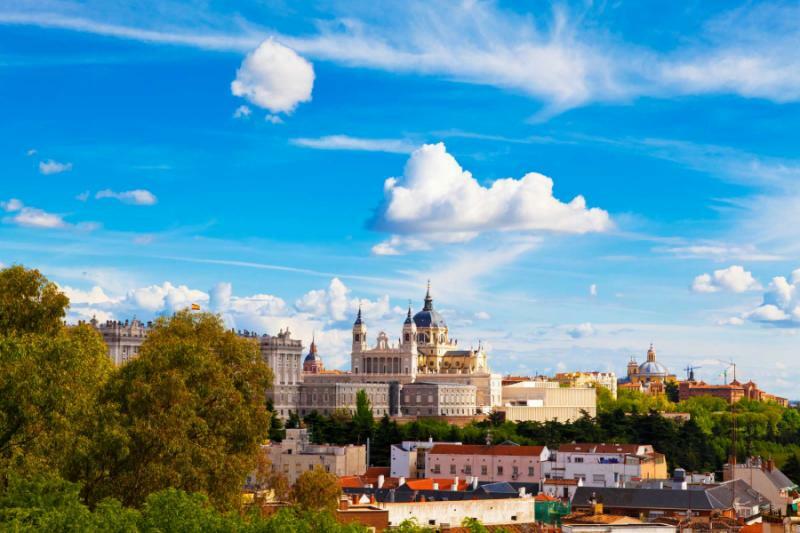 From Granada, you board a plane destined for Madrid where you connect with your international departure.